A fascinating profile of two generals who shaped history. In 1759, after the battle on the Plains of Abraham outside Quebec City, the English general James Wolfe and the French general, Louis-Joseph Montcalm lay mortally wounded, each hit by a sniper's bullet. Neither could know that the outcome on the Plains of Abraham would shape the history of both the United States and Canada. After researching letters and journals and reading dozens of books, Joy Carroll has written a compelling account of the lives and times of the two generals which is both intimate and entertaining while maintaining the highest standards of historical accuracy. The generals shed their stuffy textbook images and emerge as real people who were brave, ambitious and colorful and coped with trials that would have broken the spirits of lesser men. 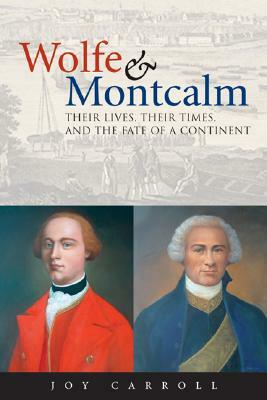 Wolfe and Montcalm is packed with fascinating accounts of the generals' mothers, lovers, friends, enemies, kings and moments of consuming passion, and the events that led up to the battle that changed the course of history. Find out what these men were really like. Read the true story of how they ended up in the French colony. How the British government failed Wolfe and the rulers of France abandoned Montcalm and how Wolfe won. Although the battle on the Plains of Abraham is the centerpiece of this work, the book also presents a rich tapestry of eighteenth century North America, France and England. Joy Carroll began her writing career as a journalist on a daily newspaper and after writing a bestselling historical romance turned to Canadian history for subsequent books.